High Peaks Pure Earth has translated a blogpost by Woeser, originally written for the Mandarin service of Radio Free Asia and published on her blog on February 20, 2018. 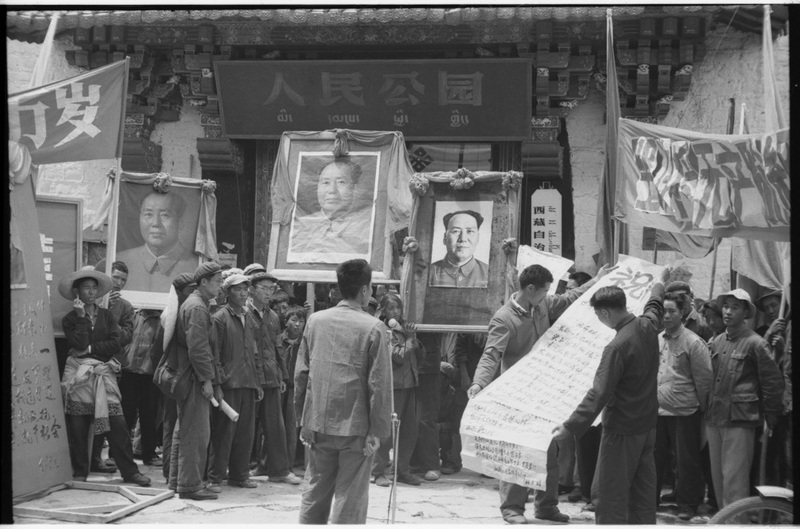 This is the sixth essay in a long series of posts about the Cultural Revolution in Tibet. The subsequent posts in the series will be published in the coming weeks. During the interview series with the New York Times on the occasion of the publication of the new version of “Forbidden Memory,” the interviewer, Luo Siling, asked me to tell the story of the main creator of Lhasa’s Red Guards and commander of the Lhasa “Rebel Faction” (Lhasa Revolutionary Rebels Headquarters), Tao Changsong. In 2011, I interviewed him twice; at the time, he was over 60 years old. He was slim and short, but his clothes left an impression: the peaked cap, the glasses and the tunic suit, just like back in the day. His gentle and refined manner made it difficult to imagine him as this majestic and impressive person that people described him to be at the time. When we first started the discussion, he was one of these typical Chinese intellectuals that one would often meet: introverted, quiet, scholarly. But he slowly changed and a temperament that once permeated his youth and middle age began to emerge; his tone became more and more aggressive and his eyes more and more fanatical. This clearly happened because the topic we were discussing was the Cultural Revolution. Sometimes he would suddenly return to the present, pause and smile apologetically, but then he would also quickly return to the shocking, yet “glorious” and eventful past. He would repeatedly say “you know, right?” and “I don’t care”. I recounted the story of Tao Changsong who was born in Yangzhou, Jiangsu Province. In 1960, he graduated from East China Normal University and volunteered to move to Tibet, where he became a teacher of Chinese at Lhasa Middle School. His knowledge about Tibet only came from a romantic “revolutionary novel” that played in Tibet, “We Sow the Seeds of Love”. All he knew about Tibetans was that men carried a long knife around their waists. During the Cultural Revolution he was the main force behind the creation of the Lhasa Red Guards, as well as commander of the Lhasa Revolutionary Rebels Headquarters. In 1968, when the Revolutionary Committee of the Tibet Autonomous Region was formed, he became its deputy director, a position equivalent to vice chairman of the Tibet Autonomous Region today. He also went to Beijing many times and met with Zhou Enlai, Jiang Qing and other key members of the Central Revolutionary Committee. There were two “rebel factions” in Lhasa during the Cultural Revolution. One was the Revolutionary Rebels Headquarters. The other was the Great Alliance of Proletarian Revolutionaries Command, or Great Alliance Command for short. The two fought each other for power. In the later period of the Cultural Revolution, the Headquarters faction lost ground, while the other faction achieved total control, and retained it even after the Cultural Revolution. Headquarters members were purged from the Party. Tao Changsong was investigated on suspicion of belonging to the “three types of people” — “people who followed the Lin Biao-Jiang Qing counterrevolutionary faction,” “people with a strong factionalist bent” and “people who engaged in looting and robbery.” After the mid-1980s, he worked at the Tibetan Academy of Social Science and served as assistant editor of the journal “Tibet Studies” and as deputy director of the Modern Tibetan Research Institute. Now he’s retired and lives in Chengdu and Lhasa, where he is in good standing with the government. Tibet was an exception to the general practice of purging the “three types of people” after the Cultural Revolution. In Tibet there were few purges of that kind. When Hu Yaobang came to Lhasa in 1980, he put an end to the purging of the “three types.” Why? Because there were many Tibetans among them. Hu thought if you purged them, the party wouldn’t be able to find reliable agents among local Tibetans. So the party couldn’t purge them. And some of them not only were shielded from purges but even received promotions. As a result, the people who rose in power during the Cultural Revolution still dominate Tibet, whether Tibetan or Chinese, which is one key reason for why the “Tibet question” has been so difficult to solve. Luo Siling further asked me if Tao Changsong was willing to be interviewed. In fact, he really was. At the time, I was still working as an editor for the China Federation of Literary and Arts Circles in Tibet. I heard people talking about him, so I found out his phone number and contacted him. To my surprise, he was very accommodating; the first time we met, we talked openly for several hours and he even invited me for dinner. But I knew his background, I didn’t show him my father’s photos, assuming he might not tell me the story if he saw them, since he appears in one. It shows him at the Dalai Lama’s summer palace, the Norbulingka, leading a team of Red Guards hanging up a poster on which is written “People’s Park.” He asked me why I was interviewing him. I told him that I wanted to write a novel about the Cultural Revolution in Tibet, upon which he replied that writing a novel would be of no interest and that I should write about actual events. I later understood why he agreed to be interviewed, he hoped to be able to speak as the “Rebels Commander” through me. During the interview, Luo Siling also asked about the differences between the two factions. 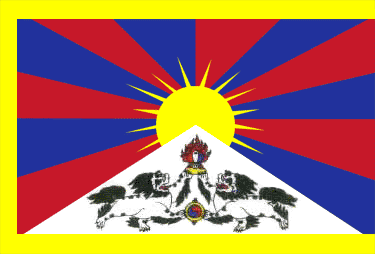 From my research I came to know that the existence of these two factions in Tibet resembled the situation in the rest of China; it began with the “destroy the four olds”, the denunciation of “monsters and demons” and the name changes. Too many bad things happened. Mao Zedong’s “Destroy the Four Olds” campaign was a movement to label any non-Communist culture as “Old Culture” and destroy it. Tibetan traditions, religion, culture and elite had no chance of escaping it and were met with devastating disaster. Tibet did not have many inhabitants, but the over 6000 monasteries and temples and countless Buddhist treasures were quite impressive; generation over generation of Tibetans had gathered their treasures inside monasteries. But after the 1950s, during the “religious reform”, the “democratic reform” and the Cultural Revolution, only very few monasteries remained and were left deserted; the whole of Tibet was turned into one big ruin. Subsequently, the cultural struggle between the two factions turned into an armed struggle; the big-character posters, great criticisms, the revolutionary networks, all of this developed into a struggle with knives and guns and eventually into a bloody and deadly civil war, which led to immense losses, great suffering and many controversial cases; it is impossible to summarise this in a few sentences. The armed conflict was most severe in 1968 and 1969. Both sides had many casualties. In Chamdo, according to my interviewees, over 200 people were killed. In Chamdo, both factions have their “memorial grounds”, there are Tibetans and Chinese among the dead. Also, the military took part in the Cultural Revolution in Tibet, they were simply everywhere and assumed an important role. The military added fuel to the situation and made the Cultural Revolution in Tibet even more complicated. Even though they had orders not to take sides, soldiers had their own opinions, some supported the “Rebel Faction”, others the “Great Alliance Command”. I interviewed a military officer who had been appointed a post in the Tibet Military District and who admitted that factionalism within the troops was severe. To the point that in the logistics department, a deputy head was beaten to death by soldiers of the opposite faction at a public criticism meeting. Moreover, the military secretly provided both factions with ammunition or let them loot the military arsenals; this is called “robbing in daylight and giving away at night”. The looting of arsenals was one of the main causes for the worsening of the armed struggle. I interviewed a “Great Alliance Command” member who witnessed the looting of the arsenal in Chamdo in 1968 and a member of the “Rebel Faction” who witnessed the looting of the Tramo arsenal in the summer of 1968. They both explained in great detail how the guards handed out weapons to the rebels. This direct involvement of the military made the conflict so much more bloody. I once wrote an essay entitled “A Cultural Revolution Controversy: The Nyemo Incident of 1969”, which was presented in 2006 at the “International Conference marking the 40th anniversary of the Cultural Revolution” in New York and later included in the book “Cultural Revolution: Historical Truth and Collective Memory”. This year, I continued to write an essay of over ten thousand characters in length, entitled “The Cultural Revolution Controversies: The June 6 Jokhang Incident of 1968 and the Nyemo Incident of 1969”, which was published in the first 2016 issue on the 50th anniversary of the Cultural Revolution of the Japanese journal “Thought” (published by Iwanami Shoten). Both of these murder cases were caused by the military; one at Jokhang Temple in 1968 when the military opened fire and shot dead 12 Tibetan Red Guards. Their graves are still found in Lhasa’s “memorial grounds”, which can really be called a Red Guard cemetery. China’s most famous Red Guard cemetery is in Chongqing, but there is also one in Lhasa. The second murder case, simply put, started in early March 1969 when the armed struggle between the two factions in many counties across Tibet began to be met with resistance by Tibetans, which was then labelled as a “second armed rebellion” (the first one refers to the Tibetan uprising against the CCP regime between 1956 and 1959) and, under the name of “pacification”, suppressed by military. But this “pacification” took on dimensions that makes one blaze with anger. Even though I have written two books and related essays, I feel that the Cultural Revolution in Tibet is so complicated that I am really only scratching the surface.